1. I really did NOT want to cantor yesterday. Just wasn't feelin' it. Plus, I had this frog in my throat; couldn't get it cleared. But I did. And it was amazing! Oh, not because of me, but because a friend showed up to sing with me, and our Religious Ed. director sang, and two of our high school girls played clarinets, and it just all melded and worked and was incredible! 2. 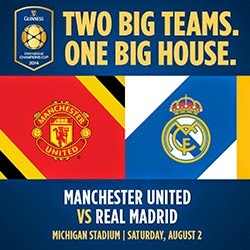 Dear Husband and I were two of 109K+ people to watch Manchester United play Real Madrid Saturday at U of M. It was incredible to watch these two powerhouse soccer teams with a record-breaking crowd. Once in a lifetime experience! 3. Baptism! My two newest great-nieces have had their adoptions finalized and will be baptized this week. I'm so happy, excited, thrilled! 4. 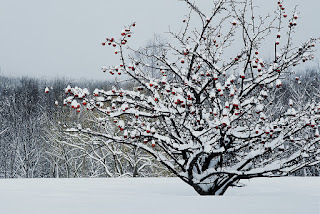 Going to meditate on yesterday's Psalm this week: "The hand of the Lord feeds us; he answers all our needs." I need to remember that God answers my needs, not my wants, and His answers may not always be my answers.